Sometimes the simplest food gets overshadowed by the reputed much acclaimed dishes. Todays Poppy Seeds Paste is one such dish which because of it's simplicity doesn't get much attention. But trust me or ask any Bong and we swear by this traditional Bengali dish. 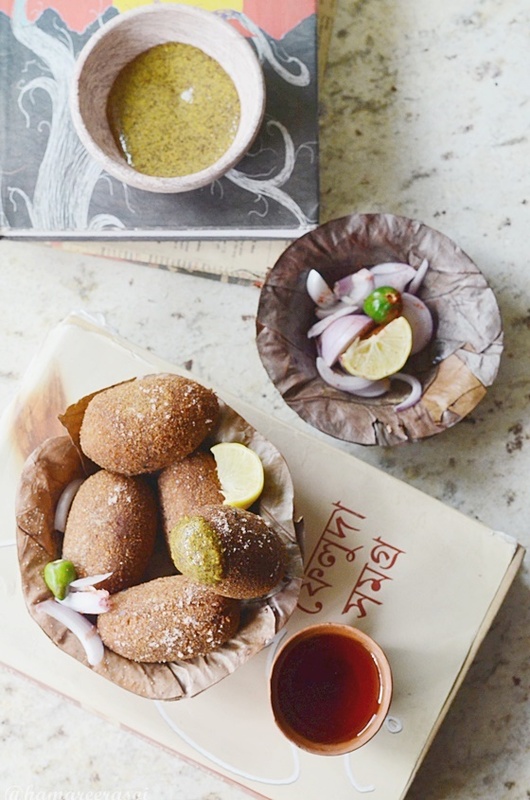 Very popular in Bengali, Kancha Posto Bata is essentially famous at Ghoti's (originally from West Bengal) household, infact to some extent they are obsessed with Poppy seeds! Well I simply love this traditional dish with plain rice. Soak poppy seeds in warm water for 20 minutes. Later transfer it to a sieve and wash it properly under tap water to remove any residue. Now for grinding I rely on 'Sheel-Nora' or grinding stone that can be found in Bengali kitchens, as it takes very less water to make a paste and you can stop grinding when you get your kind of texture. Grind the poppy seeds with very little water along with salt. Keep grinding till the paste becomes velvety smooth. Do the test by pressing a little amount of paste between your thumb and index finger, if it feels grainy then continue grinding. Scrape the paste neatly from the Shee-Nora / Silbatta to a bowl. Add mustard oil, chopped onions, green chilies and coriander leaves. Mix well and serve with steamed hot rice. 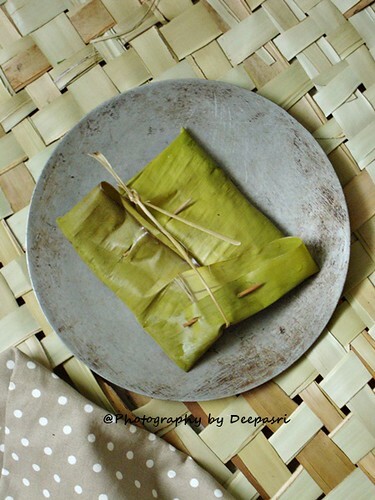 read more.. "Kancha Posto Bata | Raw Poppy Seeds Paste"
Ilish Bhape or Bhapa Shorshe Ilish is the quintessential Bong fish preparation. Come Mansoon and Bengalis will start making a bee line in the fish market to fetch out the best ilish from the fresh catch. Hilsa or Ilish undoubtedly stands tall above all other fish varieties and the heavier it is, the tastier it is. 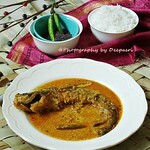 Fish is the staple diet of Bengalis and we make plenty of dishes with Ilish. The excess demand in and around the world has made Ilish /hilsa staring at the danger of extinction so we should save our pride so that our next generation too can enjoy the heavenly dishes from Ilish. 'Bhapa' in Bengla means 'steamed', the procedure is quite simple actually, all you need is an air tight steel tiffin box in which after adding all the ingredients with the Hero of the dish (be it Fish or Vegetable), the food is cooked in its own steam. And 'Shorse' means mustard sauce, now black mustard seeds is more pungent than yellow variety so if you want more pungent smell and flavour you can take 2 tbsp black mustard seeds instead of 1 tbsp in the given recipe. 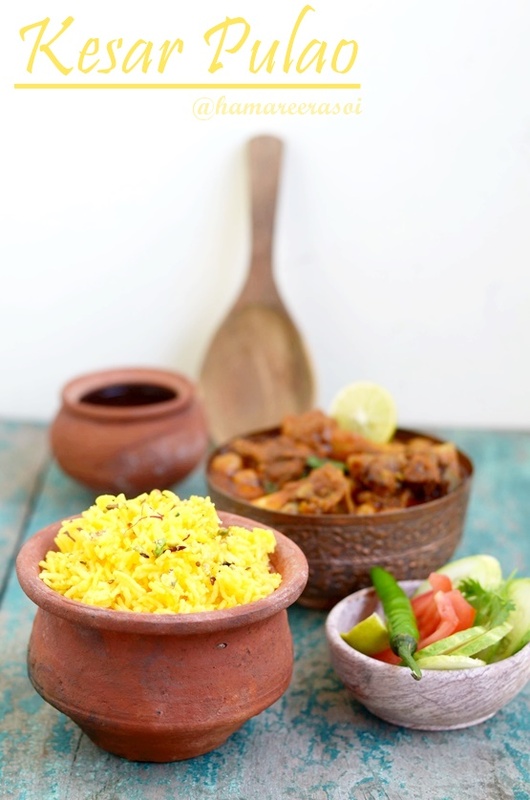 This Bhapa Shorshe Ilish preparation is best enjoyed with steamed rice. So let's get started! 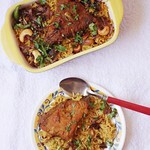 Do check my Ilish Pulao recipe and Ilish Paturi recipe too. First step is to season the fish pieces with a little bit of salt and turmeric. Keep aside. Soak mustard seeds in water for 2 hours. In Bengali households we have Shil-Noda (Sil-Batta) which is used for grinding and making paste of different spices. We can achieve the same result with a mixi- grinder. Grind mustard seeds with a pinch of salt and 2 green chilies. Here I would point out the importance of adding salt while making the paste of mustard seeds, it reduces the bitterness to great extent. So don't skip adding salt and green chillies while grinding mustard seeds. Now add the grated coconut into the jar and make a smooth paste. Take a steel tiffin box and add beaten curd, slit green chillies, kashmiri red chilli powder, sugar, place the fish pieces and add the above paste. Coat the fish uniformly with the paste, add salt and a generous dose of mustard oil. Close the lid of the steel box. Take a thick bottom pan / kadhai and pour little water and place a separator. Carefully place the tiffin box in a way that water should not enter inside the tiffin box (check again that only half portion of the tiffin box is immersed into the water). Cook for 10 minutes on medium flame. Once done, take out the tiffin box out of the pan and open the lid. Serve hot with piping hot steamed rice and enjoy your meal. read more.. "Bhapa Shorshe Ilish | Steamed Hilsa In Mustard Sauce"
Wheat Halwa | Dalia Ka Halwa | Sweet Dalia | Gehun Ka Halwa is a very healthy and sweet dessert to make.This Dalia Sheera or cracked Wheat Halwa recipe is super healthy and healthy breakfast recipe for kids or toddlers. Broken Wheat Halwa is also offered as Prasad to the deity during festivals. To make it healthy and tastier, I have used Nolen Gur here (you can use jaggery if not available). The taste is heavenly if I may say so. One of the key point is to roast the wheat in ghee which gives the halwa nice brown colour and intense aroma. I love adding dried black currants in my wheat halwa as these are power house of nutrients, excellent source of antioxidants, fiber and iron. First we need to melt the jaggery or nolen gur with a cup of water. Heat and bring to boil, keep stirring till jaggery dissolves completely. Turn off the flame and keep aside. Once the mixture is at room temperature, filter the nolen gur -water or jaggery water using a strainer and keep aside. Take a thick bottomed pan with a tbsp of ghee, add cinnamon and roast broken wheat until it leaves nice aroma (2-3 minutes roughly) . Add 2 cups of water and stir well with dalia. Cover with a lid and cook till the dalia is half cooked. Also you will see the grains after cooking time have become little bigger in size. Now add filtered nolen gur-water / jaggery water to the dalia and add cardamom powder to it. Stir well. Cook it further until the water is absorbed in daila (6-7 minutes) . Keep stirring in between and add the remaining ghee little by little. In a tadka pan ghee fry the dry fruits and add to the halwa. By now the halwa will form a whole mass and won't stick to the pan. Turn off the flame and delicious wheat halwa is ready to serve. You may replace sugar with jaggery here but then the color of halwa will not be dark as seen in the picture. You may have to add more water depending on the variety of the dalia. I use small grain dalia which relatively absorbs less water than coarse grain dalia. The thin brown wheat variety gives a darker and smooth texture. If you are pressed for time then pressure cooker saves time while making this halwa. Pressure cook the broken wheat with double amount of water and cook until 2 whistles. Rest of the procedure is same. Hope you make this simple yet healthy sweet halwa for the coming Navratri and hope you like it as much as we do. 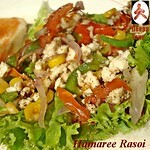 If you have any queries or you have made this recipe, would love to hear it your feedback. 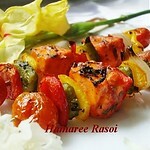 Do write to me at hamareerasoi.deepa@gmail.com to share the picture of the dish that you tried. read more.. "Samba Broken Wheat Halwa |Navratri Recipe | Dalia Ka Halwa"
Taal Shash / Ice Apple / Nungu Smoothie: Taal Shash (in Bangla) or jelly like sweet sap kernel of the Palmyra are hot favorites. Loaded cartful of these summer coolants are found being sold at every nook and corner of our city. Though I fondly remember having it from the trees at my grandma's backyard, Kolkata. It has many names Toddy Palm Fruit / Sugar Palm/ Tala Saja in Odiya/ Taati Munjalu in Andhra, Tadgole in Marathi, Taale Ningu in Kannada, Taal Shash in Bengal, With the abundance of Taal Shash in Chennai, we are fortunate enough to have it so often either as a fruit or as refreshing drink. Today's recipe is a very simple drink made with Ice Apple, milk, sugar and few pistachios. Palm fruit has tons of health benefits hence it is widely consumed during summers. Peel the brownish skin from the palm kernels and cut into small pieces. Add milk, taal shash, rose water, sugar and few ice cubes in a blender and blend till you get a smooth consistency. Adjust the sugar quantity according to your taste. Pour the liquid in tall glasses and garnish with a small pinch of roasted cumin powder. You may add pudina on top and serve chilled. While buying Taal shash / Nungu, ask for tender and soft ones. You may add small chunks of ice apple while serving the drink for extra bites in between. read more.. "Taal Shash er Shorbot |Ice Apple Smoothie | Nungu Milkshake"
How To Make Pomelo Juice: Pomelo is the biggest fruit in the citrus family. Perfect combination of sweet orange and mild grapefruit, Pomelo is rich in Vitamin B and C. It has a very thick green rind while the edible pulp inside is white, red and pink, depending on the variety. Being the largest citrus fruit, Pomelo is big in appearance and inside the juice sacs of the segments are bigger. In WestBengal 'Pomelo' is called Batabilebu or Jambura and we make delicious chaat (Jambura Makha) with fresh pink arils of the fruit with black salt, mustard oil, pepper, sugar and chopped green chilies. Ummm nom nom...Jambura makha is a delicacy among Bengalis that's why the mere mention here has bring back flood of memories. The health benefits of Pomelo are innumerable. Excellent for Urinary Tract Infection, boosts immune system, aids in weight loss, anti -aging, treats cold and cough and maintains normal blood pressure levels. So if you have not tried this amazing source of Vitamin C, go for it right away! After all how could you ignore the benefits and astounding health boosts Pomelo offers? Cut the pomelo into 4 equal sections and remove the thick rind to avoid the bitterness. While it takes little time to peel the membrane from around the segments but it is worth it. Remove the fairly large seeds. Put everything in the blender and TaDa! Enjoy the traditional refreshing drink in a healthy way! read more.. "Pomelo Juice | বাতাবি লেবু রস"
"Think Global, Act Local", I thought of this well known proverb when I was asked to taste and share my opinion about two newly introduced meal from McDonald's. 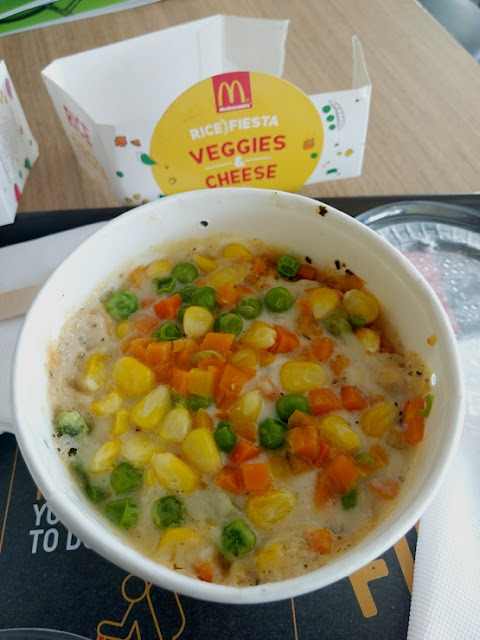 This is called as Rice Fiesta which was introduced in Chennai on 25th January to attract to the traditional population who would love to visit McDonalds for it's youthful buzz and at the same time seek out traditional taste in the restaurant. 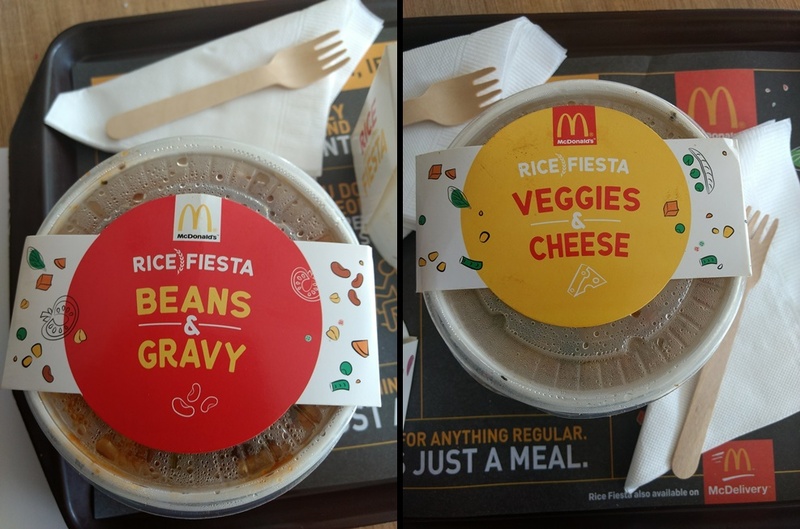 Now turning my attention towards two distinctly different looking bowls of Rice Fiesta. First about the Cheese and Veggies Rice. Once you open the lid you are greeted with a layer of thick cheese sprinkled with a generous amount of vegetables like peas,carrot, American corn and Zucchini along with herbs. Just below this layer there is steamed basmati rice. There is also an instruction on the bowl that asks you to mix all the contents to enjoy the full taste of the Cheese and veggies Rice bowl. If anyone likes cheese and is of the less spicy type he or she would love the taste of it. 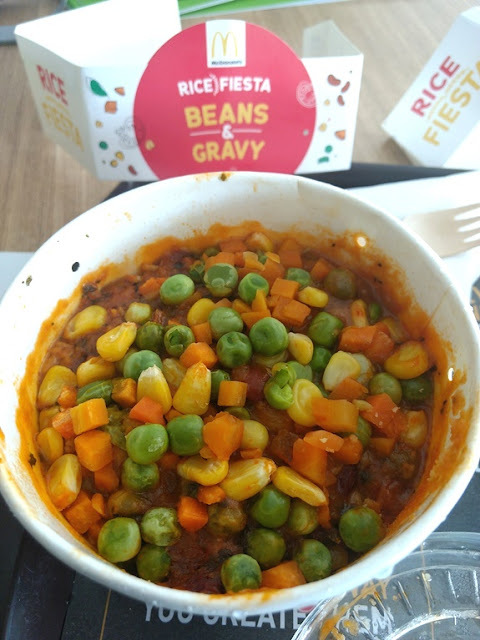 The next variety is more spicy thanks to the addition of hot tomato gravy mixed with peas, carrot, chickpeas and kidney beans. This Beans and Gravy Rice should attract the patrons who like to have gravy rice tastes same as their home kitchen. It was little spicy for my tastebud though. 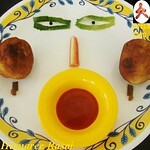 Both the above meals could be converted to non veg ones by having chunks of crispy and spicy chicken added with them. As far as my opinion goes both the rice bowls are something new for Chennai which is predominately a rice eating city. So kudos to McDonalds team to cater to this vast majority of the people. The taste of both the bowls are good and even children who are mostly burger eaters could also add these bowls in their menu so that they could enjoy the International taste of burgers along with traditional rice meals. read more.. "Rice Fiesta From McDonald With A Taste Of Chennai"
Cut off the roots of coriander, pudina and rinse all the greens. Blend all the above ingredients except yogurt and salt. Grind for 30 seconds and open the lid to stir well. Add the yogurt and salt to get nice consistency of chutney. Generally it doesn't need water as yogurt fills the need so add water accordingly. Grind until all blends well into a smooth paste. Shift the chutney into an air tight container. Keep in the refrigerator and serve chilled. 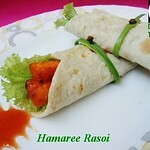 Serve this as an appetizing accompaniment with Tandoor dishes. Don't skip lemon juice in this chutney if you want to retain the green color of it. Don't forget to discard the stalks of mint while cleaning. Adjust chilli as per your spice level. read more.. "Mint Chutney For Tandoori & Kebabs | How To Make Pudina Chutney"
Take saffron in a small bowl and crush the saffron threads with a back of spoon or in ceramic mortar mash the threads so that a thick paste if formed. Now soak the saffron paste in 1 cup of warm water and keep aside. Wash the basmati rice thoroughly with water and drain out excess water. Let it soak for 20 minutes. Heat a heavy pan with well fitting lid on medium heat. Add ghee and throw in mace, cloves and cinnamon, stir for a minute. Now in the same pan add rice and salt, mix it well till rice is nicely coated with spices. 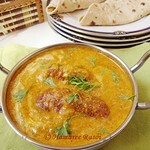 Add saffron soaked milk, cover the pan and cook it for 10 minutes or until the rice is done. Sprinkle the chopped nuts over rice and fluff with fork. Serve this with your choice of gravy. 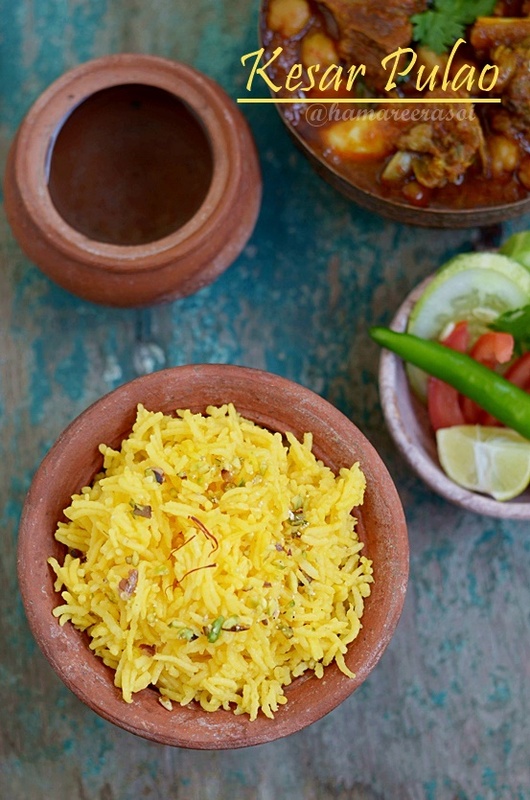 read more.. "Kesar Pulao Recipe| How To Make Kesar Pulao | Saffron Rice"
Ilish Pulao Recipe - Bengali Style Hilsa Fish Pilaf is an extremely fragrant and delicious flavoured rice. Ilish is the King of all fishes for us and every part of Ilish (except fins /scales and innards) is eaten with gusto and relish. As fish is the staple diet in Bengali households, Ilish or Hilsa is the king. A very important step once you select the perfect Ilish from the Fish Monger is, after he removes the entrails and roe from the fish and discard. Wash the fish in water thoroughly. DO NOT WASH AGAIN. Ilish or Hilsa is the National Fish of Bangladesh we being the neighboring country enjoy it with equal zest. 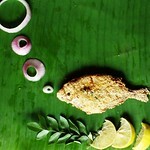 Ilish when simply fried in mustard oil become the side dish along with steamed rice. We love Ilish Paturi , Ilish Macher Jhal as much as Ilish er Matha Diye Lau er Torkari (Head of Hilsa Fish cooked with bottle gourd). 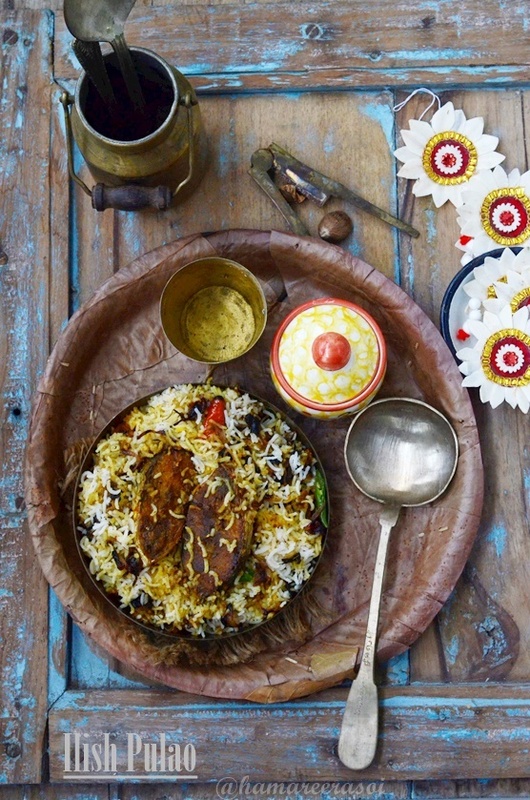 So Ilish Pulao becomes a delicacy as it brings out the best of Hilsa when cooked with minimum spices to make a pilaf. 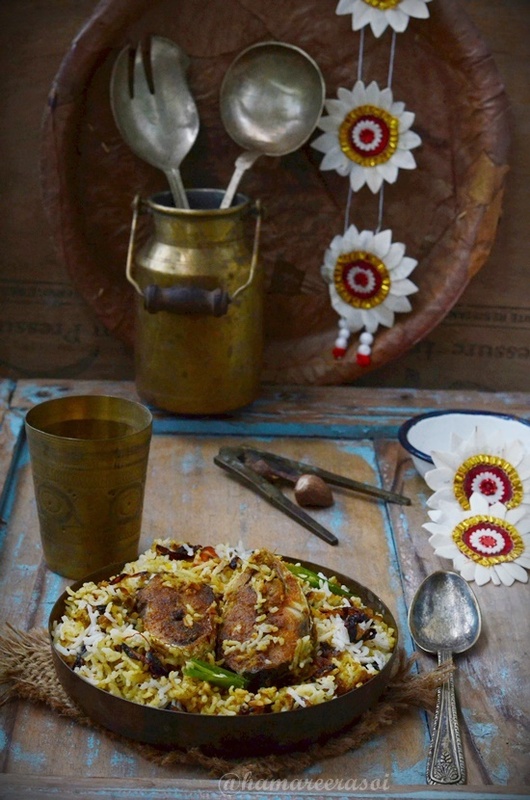 Serve piping hot Hilsa Fish Pilaf with Raita for lunch. This recipe is a part of Virtual Diwali Potluck Party, where some blogger friends from different parts of world are joining us for Diwali special traditional recipes. Look out for our collective Diwali Potluck recipes on Instagram with #diwalipotluck handle. Dear readers wishing you all a very Happy, Prosperous and Safe Diwali. Wash the rice and soak it for 20 minutes. We need to make the fish gravy now, for that marinate the Hilsa pieces with salt, green chilies, ginger paste, crushed crispy barista and yogurt. Take a flat plate and apply the marinade on the pieces thoroughly and close with a lid. Leave it for 1/2 an hour. 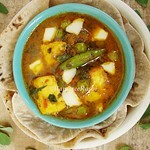 Heat mustard oil in a deep pan add the marinated fish along with yogurt paste. Cook it in lower medium heat for 10 minutes. Be careful not to break the soft Hilsa fish while cooking. By now the oil should separate from the sides of the pan. Carefully remove the fish pieces and the gravy separately from the pan. Drain water from the soaked rice and heat water (1:3 ratio of rice to water respectively) in a heavy bottomed vessel. Add green cardamoms, cloves, tej patta, cinnamon stick, a tbsp of ghee/oil along with salt into the vessel. Add rice once the first boil comes and stir well. We need to cook rice only 70% so keep an eye on the state of rice as Basmati rice takes very little time to cook. Turn off the heat and drain off any excess water from half cooked rice. Best way to make layered biryani is using it either a Handi or open wide vessel with lid.Take some gravy of fish curry and spread it at bottom layer (by doing that you can ensure the rice doesn't get brunt when slow cooking. Now place half of the rice and spread it over gravy, sprinkle some barista, a tsp of ghee and place all the fish pieces and gravy. 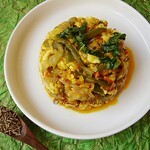 Finally put the remaining rice on top and repeat the addition of barista, ghee and some yellow food color (optional). Cover the pan with lid and cook on low flame for 10 minutes.Turn off the flame and wait for few more minutes so the the pilaf absorbs the characteristic fragrant. Be careful while serving as the Ilish should remain intact. 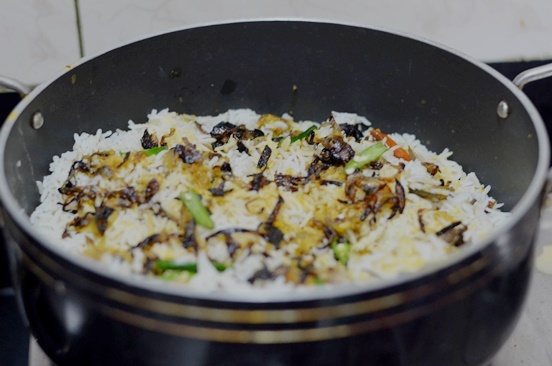 read more.. "Ilish Pulao | ইলিশ পোলাও | Ilish Maacher Pulao (Hilsa Fish Pilaf)"
"How to use Philips Airfryer to pamper yourself with an oil free Tandoori Chicken?" If you have been following me on Instagram you must be aware of my fondness for fried food items. I love Bhajis / Vadas / Potato fries, though in controlled portions. So when I get my hands on Philips Airfryer I was thanking God for giving me an early Diwali gift ! Every year during Diwali I get tempted to buy a new kitchen appliance and this year I'm proud owner of Philips Airfryer. The wonderful fryer has given me the freedom to indulge in all kinds of guilt free snacks. 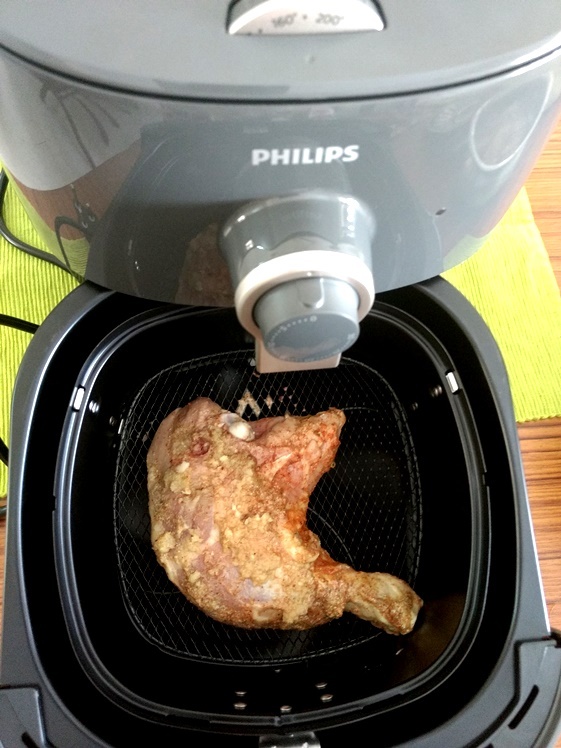 After using it I genuinely found Philips Airfryer to be a healthy alternative tool to avoid deep fried cooking. For those of us who are used to cooking/heating food in Microwave, I would like to share a few unique points that sets apart Philips Airfryer from Microwaves. 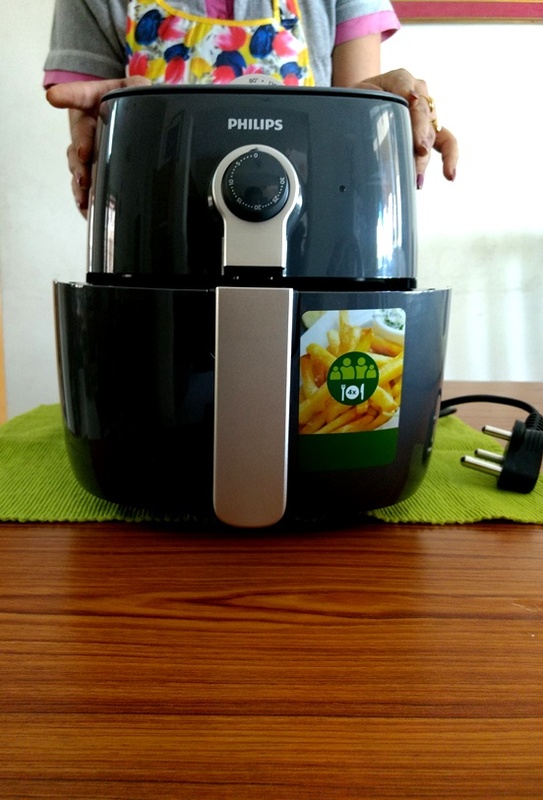 Firstly, the airfryer uses very hot air circulated around the food whereas the microwave emits electromagnetic waves using magnetron to heat up the molecules of the food. So instead of relying on radiation the airfryer uses the hot air to bring out the oil from within the food from it's innermost core. This eliminates the need to add any kind of oil whereas in microwave ovens while cooking you need to add oil even if it's a little . So if you are longing for crispy and dry foods like fried fish, chicken, potatoes, paneer, vegetables, mini pizzas,fritters etc. without having that guilty feeling of having oil with it, look no further. The answer for you to indulge in your favourite fried food sans oil has arrived in form of Philips Airfryer. So they have definitely made things better for foodies and non foodies across the world. Touche. Make incisions on the chicken pieces as this helps the marinade to go all the way inside the chicken. Put all the above ingredients in a big mixing bowl and rub the marinade thoroughly. Cover the bowl and refrigerate it for overnight. 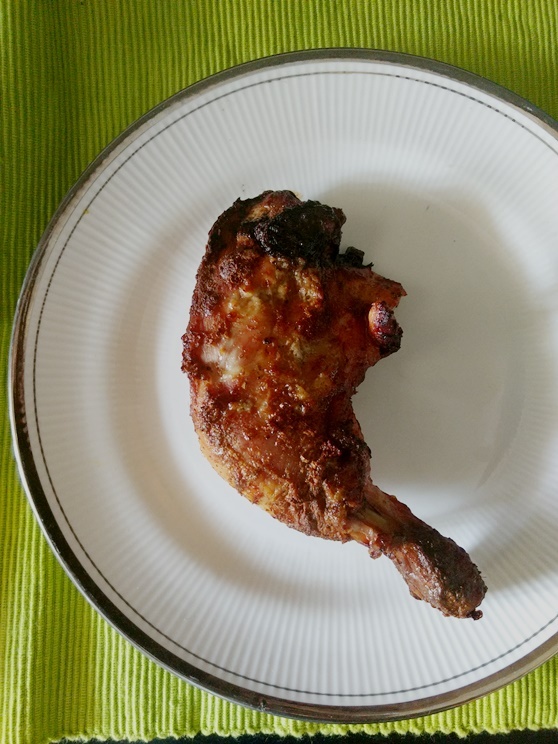 Once I placed two pieces of marinated chicken in the basket and turned on the timer, the arifryer began to heat up from inside and I could well hear the sound of air getting evenly circulated. After 20 minutes, I opened the basket and turned over the pieces and cooked it for another 10 minutes just to be doubly sure that the chicken pieces do not get stuck with each other. I didn't apply any oil with brush over chicken pieces but was pleasantly surprised with the juicy, perfectly cooked chicken. 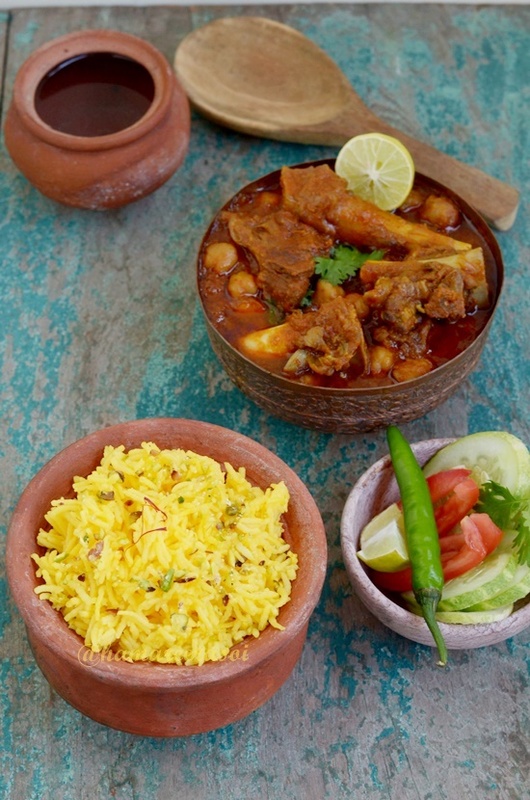 The reddish look was achieved by Kashmiri red chili powder and it had the tinge of barbecue spots here and there. 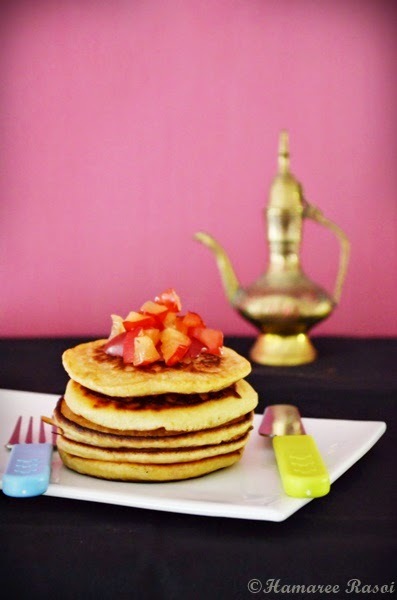 Well you have got to try it yourself to believe how delicious and easy it is to make OIL FREE recipes in Philips Airfryer! 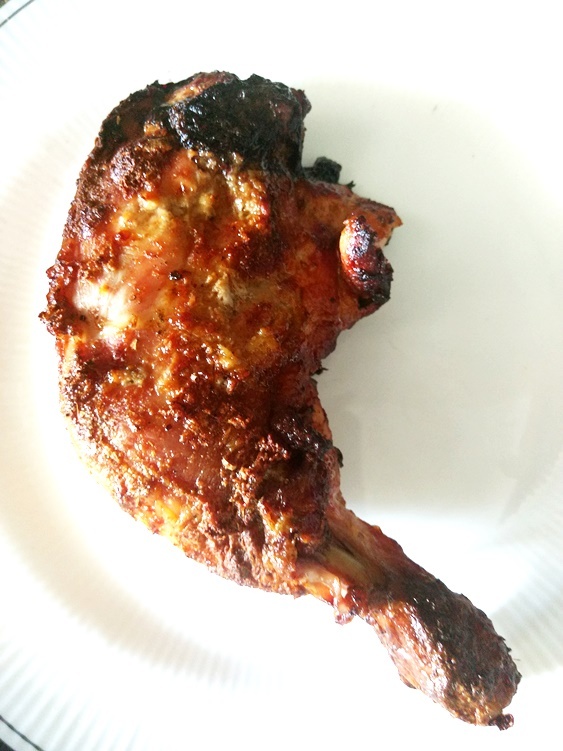 read more.. "Airfried Tandoori Chicken In The Philips Airfryer | Product Review"
Macher Chop Recipe is my today's post, 'Maach' or 'Mach' means fish. 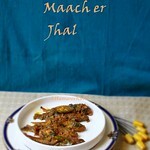 Macher Chop is a favorite Bengali snack made with fish. 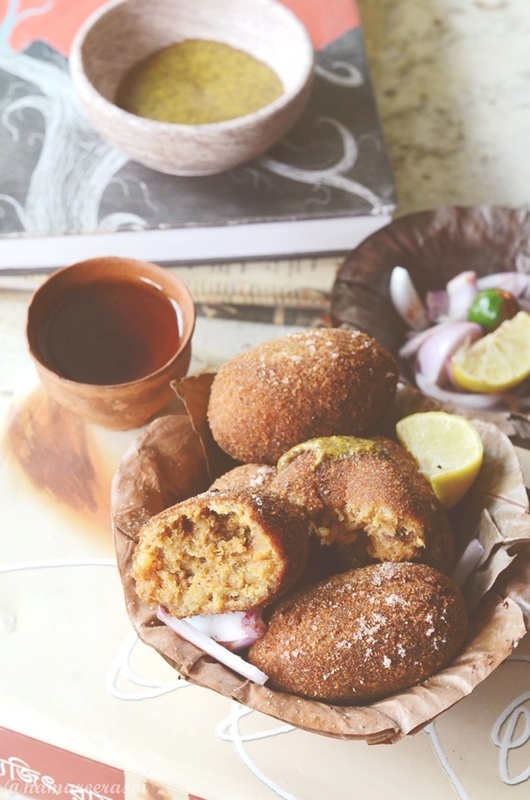 Evening snacks play a vital role in Bengali households and 'Tele-bhaja' takes the lead which literally means deep fried fritters. 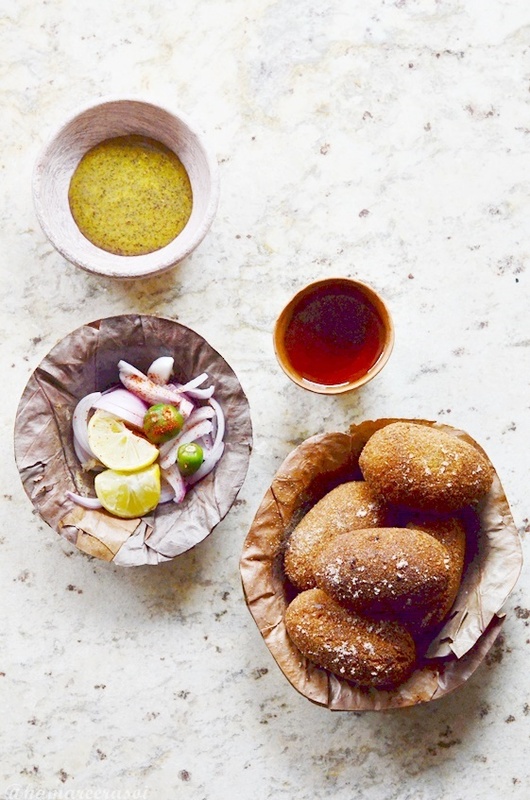 Kolkata offers many such chops like Beetroot Chops, Keema or Aloo'r Chop to name a few. 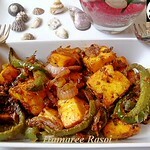 The vegetarian version of chop is supposed to be slightly on the sweeter side. But in all variations the outer shell has to be very crispy. The stuffing here is made with fish, cooked tossed with spices then dipped in egg mix and finally in breadcrumbs. 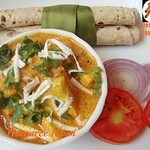 It is served with Kashundi (Bengali Style Mustard Sauce), onions and black salt. There are two ways either you can boil fish or marinate with salt and fry then de-bone it. I always boil fish pieces with some salt and cook till they are tender. Drain, discard the water and allow it to cool. Remove the bones from the fish and mash it with fingers. Peel off the skin of potatoes and keep aside. Heat 2 tbsp oil in a pan and add onion, green chilies, ginger, garlic and cook for 2-3 minutes. Add minced fish and mix well. Add all the spices, mashed potato and fry till the mixture becomes dry. Allow the mixture to cool. Take a portion of mixture and make a ball and flatten into oval shape. Lightly beat the eggs with pinch of salt and transfer to a big bowl. Keep the plate ready with breadcrumbs near it. Dip each fish chop into egg batter and then rolled into breadcrumbs. Repeat this step twice to get the crispy crust outside. Keep all the cops in a flat tray and place it in the refrigerator for 1/2 hour. Heat oil in a deep pan or wok. Carefully slide 3-4 croquettes at a time and fry until golden brown in colour. Use a kitchen towel to absorb any excess oil. Sprinkle some black salt over the chops. 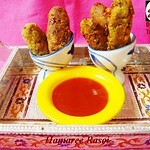 Serve these cutlets with ketchup or Kashundi and onion rings. read more.. " Macher Chop (Bengali Style) | Fish Croquette"
I am totally smitten and in love with Overnight Oats. 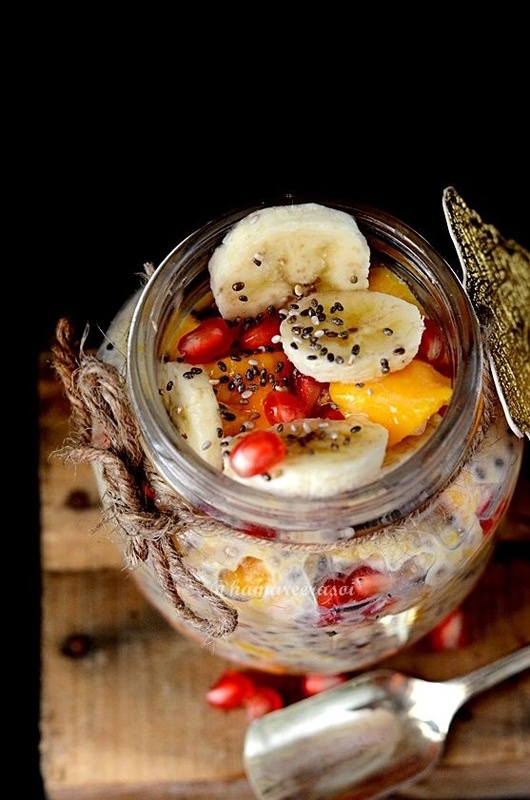 And today's Tropical Overnight Oats Jar is something which suits my taste-buds. I mean what's there not to love this quick fix? It has season's king fruit - Mango, the toasted Coconut Flakes adds that extra zing along with papaya, pomegranate, banana which are full of vitamins, minerals, fiber and very good for skin. You could use regular coconut flakes or shredded coconut in this Overnight Jar, for the extra crunchiness I have roasted coconut flakes. It's literally heaven inside a jar ! The best part is you can make it the night before and have this quick and fuss free breakfast on the go next day. Add chia, oats, honey, greek yogurt and coconut flakes in a bowl and mix together well . Place a fruit layer first in a mason jar. Pour the above oats mixture in the jar and on top garnish all the remaining fruits. Close the lid and refrigerate overnight. Take the jar out from the fridge next morning and enjoy every spoonful. 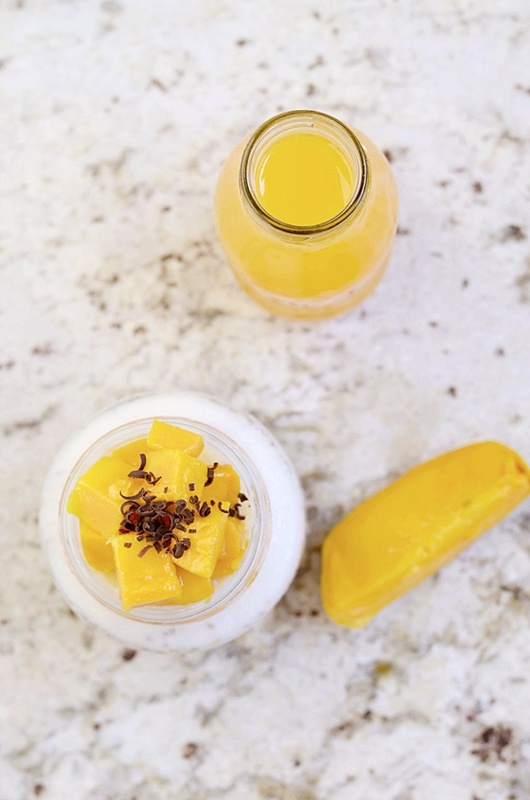 read more.. "Tropical Overnight Oats in Jar | Healthy No Cook Breakfasts"
Recipe of Mango Chia Overnight Oats :- Overnight Oats is like music to my ears. The popularity of these easy to make Overnight Oats are un-matachable, reason being many like incredibly easy fix for breakfast, simple to prepare the night before, power packed energy jar in no time to count a few. So if you have been trying to cut down time to prepare healthy breakfast, Overnight Oats is your answer. And the options are unlimited ! I now make 3 bottles at a one go for a quick rush free morning breakfast. Be creative and you can add any variety of your favorite toppings. 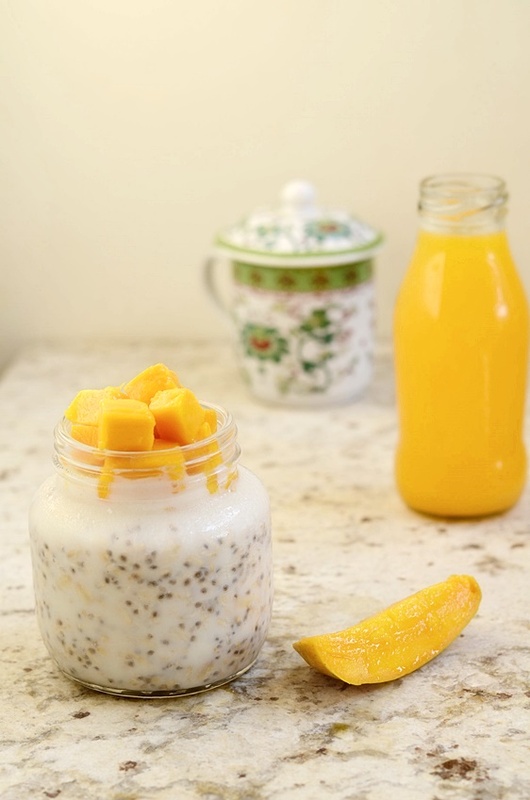 Today's post is Mango Chia Overnight Oats recipe. The choice is endless with dry fruits, chopped nuts, flower seeds, maple syrup and so on. All the below recipes are made with Old fashioned Oats also called regular old oats. Don't try to settle down with the steel -cut oats as they when soaked with milk overnight turned out chewy. The thumb rule is to add fruits, nuts, crunchy toppings at the last minute so that the chopped fruits, nuts remains fresh. Where as previous night you can add the seeds, spices along with yogurt and milk with old fashioned oats. After my workout session a glass of chilled Banana Oats Smoothie , Mango Lassi or Kiwi- Cucumber Juice along with few walnuts becomes my mid-time snack. I only use Quaker's old fashioned oats as the taste is really good. In a bowl mix together chia, oats seeds, honey and milk and pour in a mason jar. Keep in mind that next day we will be filling the diced mangoes on top of this overnight soaked oats, so make sure to leave 2 inches of room at the top of mason jar. Close the lid and refrigerate overnight. Next morning just pop it out from the refrigerator, add diced mangoes. Top with desired optional toppings. 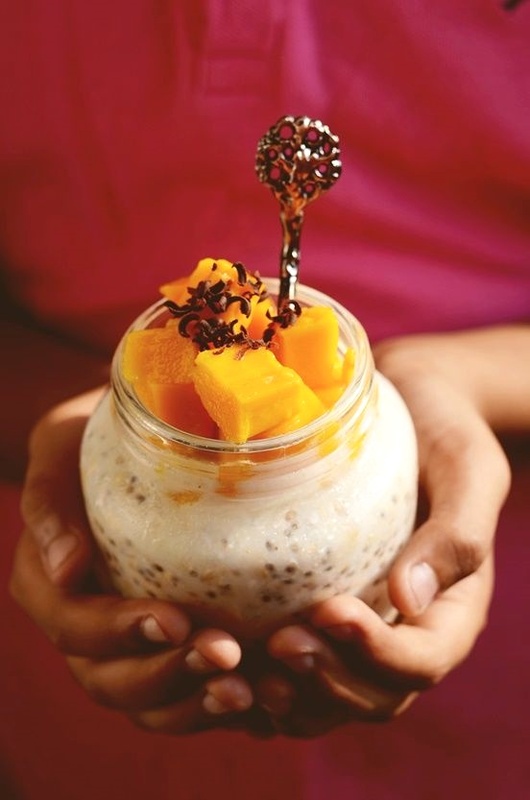 read more.. "Mango Chia Overnight Oats | Healthy Breakfast"
Botanical name of Falsey / Phalsa is Grewia Asiatica, a tiny looking purple fruit which is available during peak summer months (May- June). This delicate fruit, Phalsa, is a native of India and other sub-continent. During summers in North when heat wave is at it's peak, Falsey's consumption gives cooling effect. In most homes Falsa is eaten raw with a sprinkle of black pepper and salt. I still remember during our way back from school to home, a street vendor would be there at a corner selling huge batch of Falsey placed on a small wet jute, to keep it cool and from drying. It came with a special kind of Chat Masala which was a must to have with Falsa. And within few hours the huge batch of Falsa would be sold out in no time. Falsey is sweet with a hint of tanginess and is so refreshing that it vanishes as soon as it hits the market during summer. The health benefits are plenty ! Rich in Potassium, Calcium, Vitamin C, low on Sodium and many more health benefits. It is the nature of Falsey that it's shelf life is short so it can not be transported to other cities, hence only in Northern region the small time street vendors are often seen selling Phalsa. Sadly they are rarely sighted these days selling these beautiful purple gems. Lack of knowledge of conservation and it's benefits could also be another reason of it's disappearance. Wash the fruit thoroughly in water and leave it for 15 minutes. Mix sugar and water to make sugar syrup. Boil water for 5 minutes and turn off the heat. Soak the cleaned falsa in sugar syrup and let it sit for 5 minutes. Add chilled water and pass it through a strainer, rub the pulp through the strainer to get rid of seeds. Pour into glasses over ice and serve them with mint leaves (optional). Generally the fruit seller give a special masala with it which is khatta-meetha. I love adding it to the juice as it brings out the best taste. read more.. "Summer Special Falsa or Phalsa Juice | How To Make Falsey Juice"
I was invited by Quaker India, to be a part of Quaker Feed A Child campaign in Chennai this week. 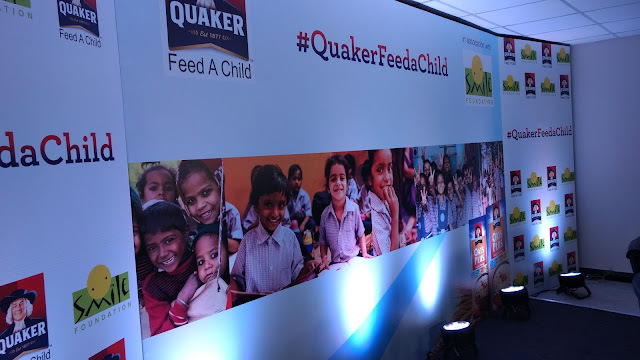 Quaker Feed A Child is an initiative that aims to bring a fistful of nutrition to lakhs of underprivileged children. To mark the launch, Quaker India along with celebrity Chef and Nutrition Brand Ambassador of PepsiCo Vikas Khanna was present for the cause. 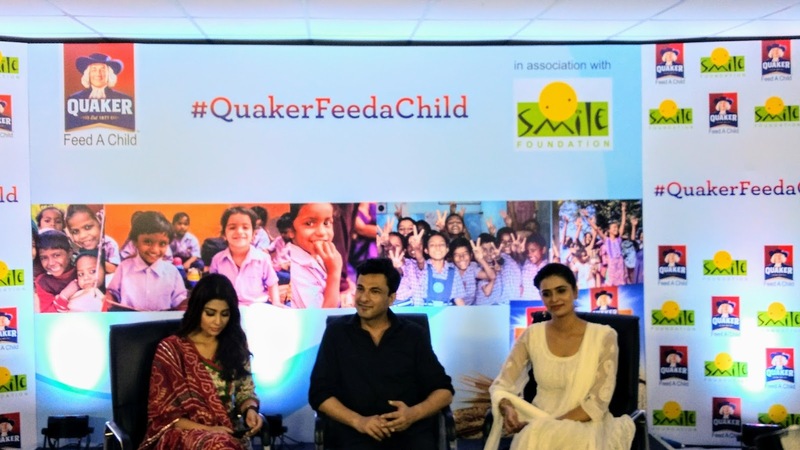 Popular actresses Shriya Saran and Meenakshi Dixit also wholeheartedly joined to share a meal with the children to mark the occasion. Completely ignoring the scorching heat children came over happily wearing green caps and welcomed New York based Michelin starred celebrity chef Vikas Khanna, noted actresses Shirya Saran and Meenakshi Dikshit. Deepika Warrier, Vice President - Nutrition Category PepsiCo India, says "According to recent reports nearly 3,000 children die daily in India due to poor diet related cases and hunger." To combat this problem Quaker Feed A Child has committed to serve 200,000 under privileged children in India through various initiatives like Cook With Smile, Dine With Smile, Million Dollar through Smile Foundation. Giving back to the society was the essence of the event, actress Shriya Saran recalls how her trips to a blind school in Delhi in her school days had a marking impression that later she opened a spa for visually challenged people in Mumbai. 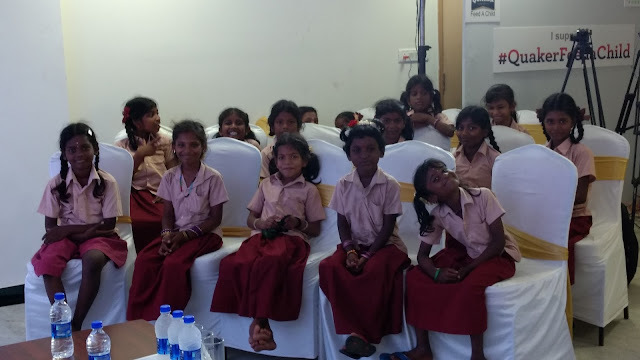 She said "I pledge my support to the Quaker Feed A Child initiative and applaud Quaker India and Smile Foundation for their efforts to bring smiles to the faces of hundreds of children in Tamilnadu." In the same line PepsiCo's Nutrition Ambassador , Vikas Khanna said "The problem of hunger and malnutrition in India cannot be solved in a day and certainly can't be achievable by one person or entity, so if each of us makes small effort to help even one child, then only we can take a big leap towards ensuring no child sleeps without food." Echoing the same sentiments actress Meenakshi Dixit said "Even after getting success in my film career, I was not getting inner peace. So when Smile Foundation approached me for supporting this initiative by Quaker, I grabbed the opportunity. I whole heartedly pledge my support to Quaker Feed A Child and urge everyone to feed one child everyday." 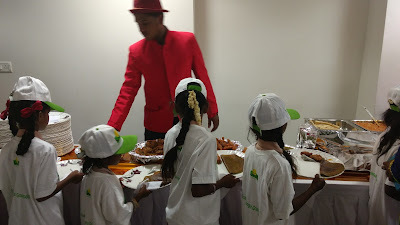 Later all the kids got a cap signed by none other than the handsome, humble chef -Vikas with a smile. And when the children enjoyed a fulfilling meal, this was the biggest take away. I was feeling privileged to be a part of this wonderful event. 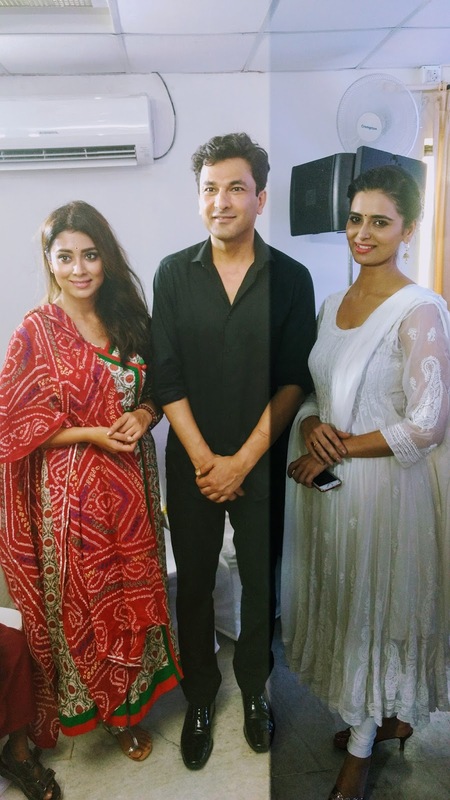 Also meeting maestro Vikas Khanna was itself a dream come true. Leaving you with some memorable pictures of Quaker Feed A Child event. read more.. "Quaker Feed A Child - Flags Off Feeding Drive in Chennai with Chef Vikas Khanna"